It's a big fight in a big electorate. Interview: Eoin Blackwell. Shot & Edited: Emily Verdouw. Like a lot of things in politics, it started with a bit of aggro. "I am not going to listen today if you don't remove the sign," cracked the voice, certain as a whip, from the bowels of the audience below the main stage at the Tamworth Capitol Theatre. 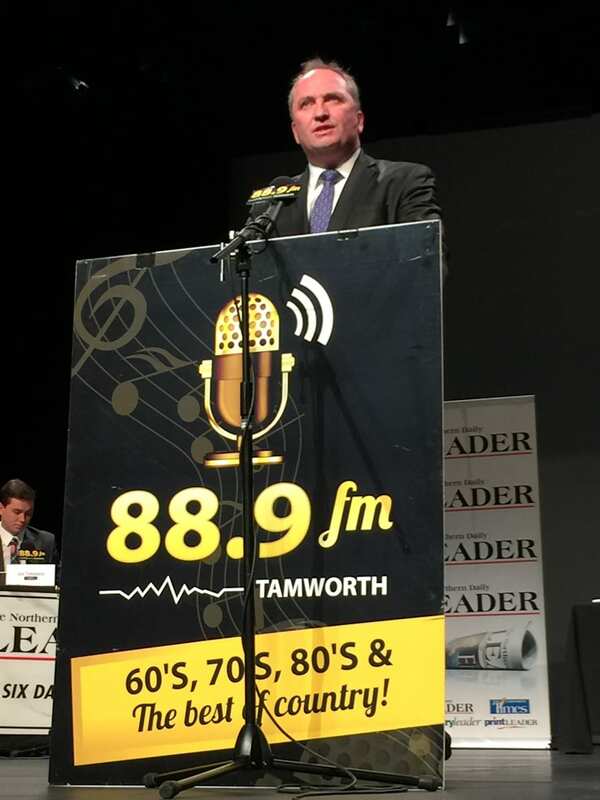 The offending sign -- an ad for local radio station 88.9fm -- almost swallowed the centre stage podium, partially obscuring the eight election candidates for the seat of New England as they took their seats at the back of the stage. The community forum was about to begin. Deputy Prime Minister and National's leader Barnaby Joyce at the addresses the crowd at the Tamworth capitol theatre, telling them the election is about New England and the nation. "This is for them to do the 90-second introduction," offered the moderator, leaning into his own podium, stage right, and peaking out behind an even bigger sign for 88.9. "I can't believe how stupid you are," cracked the voice from the seats, ignoring the slight groans and titter of laughter from the audience. It's the only breach in civility at the forum, despite the animosity between some of the candidates. At 66,000 square kilometres, the New England electorate is one of the largest in NSW, stretching from the Queensland border in the north to Merriwa, Aberdeen and Scone in the south. It contains the nation's food bowl, taking in prime agricultural land and its vast fields of nutrient rich, black soil. Despite New England's size, and the number of candidates in the election (there are 10 in all), it's become a battle ground between two men. Independent candidate for New England, Tony Windsor, tells voters in Tamworth he is running to secure policies for future generations. Nationals leader, Deputy Prime Minister and current member, Barnaby Joyce; and Tony Windsor, the independent who held the seat for 12 straight years until 2013. And man has bit of manure on them, in the eyes of voters, and each other. On the one hand there is Joyce -- once referred to as the best retail politician in Australia by his former boss, Tony Abbott. But despite his skills, and his place in cabinet, he couldn't stop the Shenhua Watermark coal mine from being approved on the Liverpool Plains, where seventh and eighth generation farmers now fear the future of their black soil and crops will be threatened. But then there's Windsor, whose support of Julia Gillard's minority Labor government has permanently linked him in some voters' minds to the live export cattle ban -- prompted by revelations of inhumane slaughter of Australian cattle in Indonesia. "It was a huge impact," said Kevin Tongue, a primary producer from Loomberah, a few kilometres south-east of Tamworth. "We won't forget that Tony sided with he Labor Party and stopped the live cattle trade, and how much that really affected regional Australia. It was devastating. "I'm sure it's still in their memory, fresh in their memory, because it's still hurting." Tamworth has been the site of a few of the nation's firsts, and is quickly becoming the site of a few lasts. It was the first Australian city to get electric street lights in 1888, while now, in 2016, the NBN has stalled in the rural electorate. For Durai resident Kathryn Pigot, a bookkeeper and carer for her husband, the NBN is a major issue. "I'm using wireless NBN at the moment, but if I can get copper to the house and it's faster than I have, then it will continue to enable me to work from home, which is helpful in our family situation," she said. "I don't think the Coalition is going to change their point of view on the NBN and how it's rolled out, and how it's supplied. "I'll stick to the Independents. The Tamworth area, the New England area, OK, it's mainly farming but it's not all about farming. There's a lot more here." Windsor temporarily retired in 2013, essentially gifting the seat to Joyce, 12 years after wresting it from the Nationals in 2001. A former National himself, Windsor quit in 1991 after the party executive installed a candidate above him, despite Windsor winning endorsement from several branches. He took time off to spend with his family after 22 years in state and federal politics, but the wheels started turning again in January when he heard Australian of the Year David Morrison declare "the standard that you walk past is the standard you accept". "That really nail-gunned me in the sense I was thinking 'you have a real chance to win a seat here, not just argue the toss and have a good night at the pub'," Windsor told The Huffington Post Australia in Scone. For Windsor, the fight is partly about protecting his legislative legacy as well as what he sees as important, long-term policy initiatives for the country. Gonski school funding, the NBN, climate change policy -- all areas Windsor, as an independent with a balance of power vote, "had a thing or two do do with" under the previous Labor Government. "My wife said to me there at one stage, 'what if you're defeated?'. I said I'd feel worse if I didn't have a go, and that's exactly what I'm doing. And we could win this seat. It's winnable," he said. HuffPost Australia approached Joyce's team before visiting New England, but citing his demanding campaign schedule, both locally and nationally, he was unavailable for a meeting. Windsor is relying on polling he says shows the issues of concern to him are also the concerns of the electorate: health and aged care funding, Gonski, mining and the NBN. 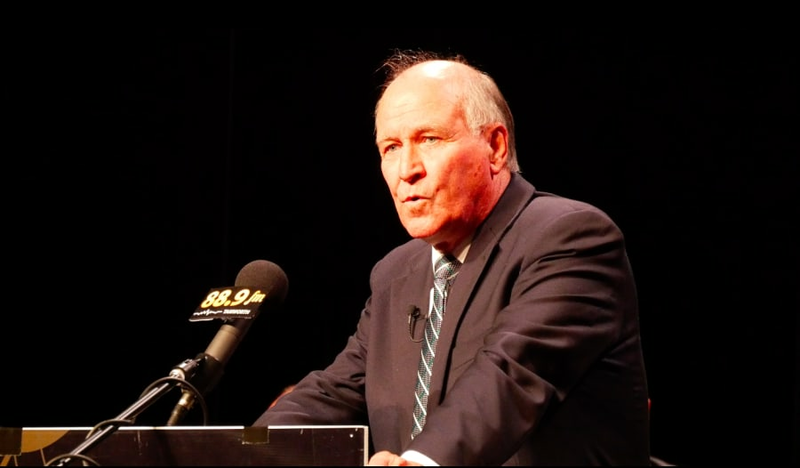 "The future of our political system and the need for an independent commission against corruption," Windsor explains to the audience at Tamworth Capitol Theatre, from the podium at the centre of the stage. "I am standing because I am worried for future generations that don't even exist yet. "If we want to reside in a short-term political, opportunistic climate I would vote the way we're voting at the moment." 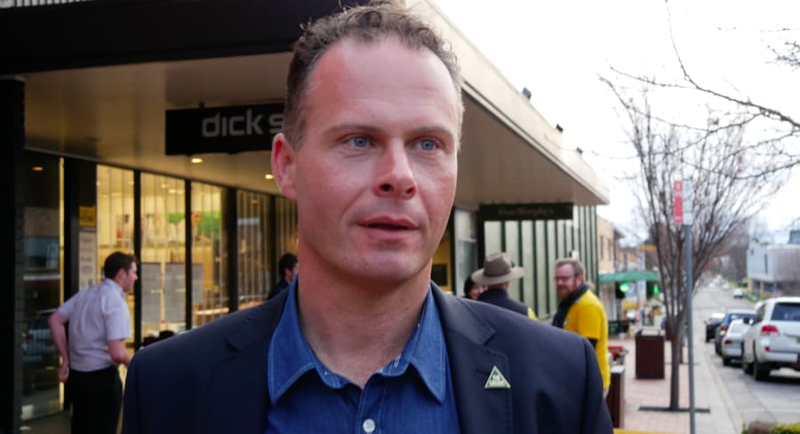 Greens candidate Mercurius Goldstein recognises New England as a conservative electorate (it's last Labor member, Francis Foster, was elected in 1908 -- so long ago Labor was spelled Labour), but the parliamentary hopeful believes Greens preferences will impact the election. "The New England has a very progressive history," he said, telling the HuffPost it was a woman mayor who switched on the street lights in 1888. "The election for New England will be won and lost on where Greens voters direct their preferences, because its clear we have a very tight election. For Joyce the battle is about the future too; his own, the electorate's, the country's. It was only in February he claimed the coveted regional twofer: Leader of the National Party and Deputy Prime Minister. He wants to move the veterinary medicines authority from Canberra to Armidale, about an hour-and-a-half from Tamworth, estimating that would bring with it 175 to 200 jobs. Joyce is also campaigning for a new sports centre in Tamworth, 32 new mobile phone towers and upgrading roads from the Queensland border. "It's also about our nation, ladies and gentlemen. A nation well defended, a nation with strong books so we can actually pay for things into the future, a nation with a steady hand at the tiller, a nation with strong borders and a nation experiencing record cattle prices," he said. "Because this election ladies and gentlemen, without a strong hand at the tiller, will all fall to nothing. This election is not just about new England. This election, in this seat, is most definitely about our nation." Barnaby Joyce is a busy man -- his commitments as Deputy Prime Minister and as National's leader has put demands on his time as he runs for reelection in the seat of New England. But despite the issues, the campaign has become nasty in recent days, with Windsor calling in lawyers over a news article detailing allegations he bullied students while in high school. The former MP has also demanded an apology over an election attack ad it is claimed implied Windsor is a cheating husband. While meeting HuffPost Australia last week, Windsor had pause for a phone call from a campaign adviser about a negative ad. "I'm used to nastiness," Windsor said, hanging up. "He's put out a nasty thing about me apparently." 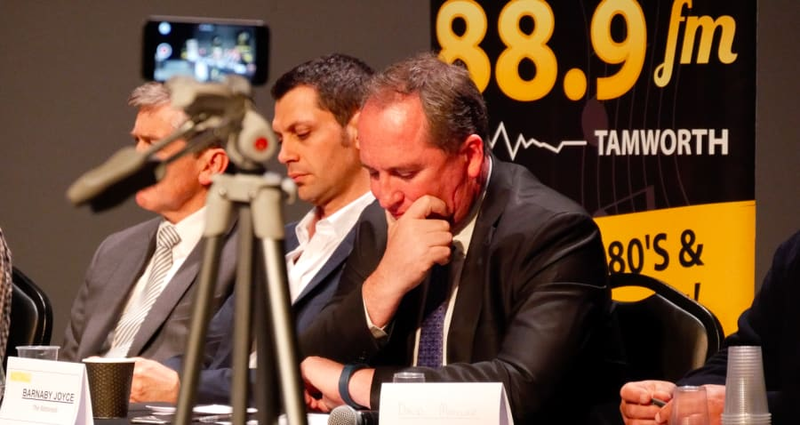 Joyce on Monday told the ABC he offered to withdraw the advertisement, but he said Windsor didn't respond to negotiations which would involve him also withdrawing his ads. But it's unclear how the back and forth negativity will affect voter sentiment. The day after the community forum, about 85 kilometres away in Spring Ridge, 23-year old farmer James Clift digs his hard hands into the soft, black soil on his family's 10,000-acre farm. He delicately extracts a wheat bulb and a clod of dirt, as his partner Holly peers into his big hands and the earth worm that's nestled close to the root. "Do we have to spray it?" Holly asks. "Nah. Earthworms mean it's healthy," replies Clift, before he places the budding wheat back in its place among hundreds of rows of green sprouts that seem to stretch endlessly into the distance. 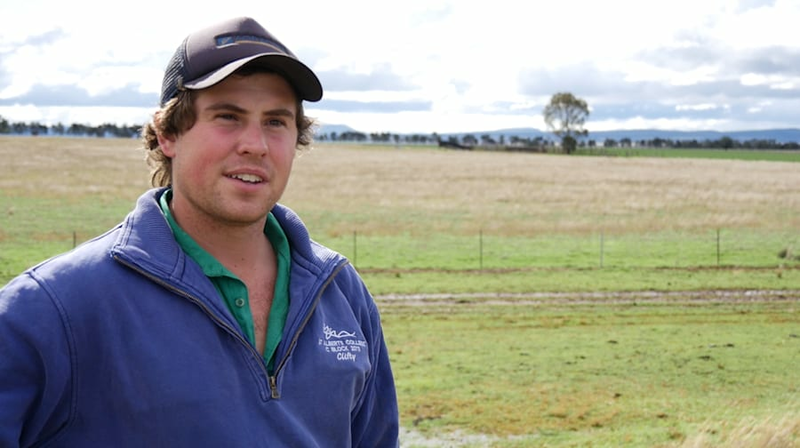 Clift, who manages 200 acres of the farm with his brother brother Angus, 21, has his eyes fixed firmly on the future too. In fact he can see it, with a proposed pit for the controversial Shenhua mine just over a ridge bordering the property. While that part of the mine, if it goes ahead, isn't expected to be cut until 2030/2040, the Clifts think long-term. James Clift on his 200 acre property -- the ridge behind the 23 year old farmer is where the proposed coal mine pit as part of Shenua Watermark coal mine might be built by 2040, and part of the 10,000 acre Clift family farm falls within the mine's buffer zone. Their family has been farming the region for eight generations. We ask James who he's going to vote for, and he points out both Joyce and Windsor are publicly against the mine. But then Joyce couldn't stop it, and then there's Windsor with his support of Labor. "It's tricky," Clift said. 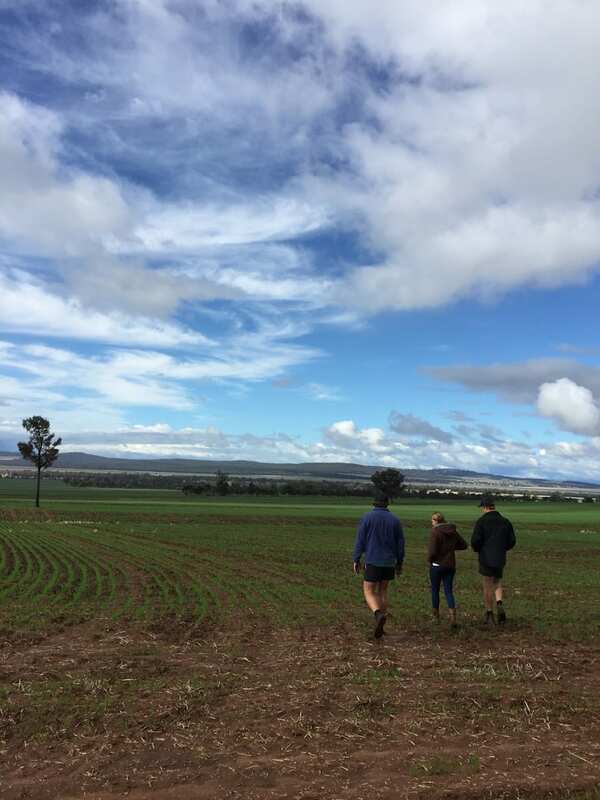 He, Angus and his sister Sophie, 22, are part of the Liverpool Plains Youth group, an organisation of about 150-200 residents and farmers concerned about the effect of extractive industries on the land. They've been busy, attending speeches around the area and in Canberra to raise their voices and their concerns. "We don't really get in people's faces," said Sophie. But the frustration is real, and the fight is personal. "It's beautiful around here. There is nothing like it in Australia. You have to preserve it," she said. Both Joyce and Windsor have campaigned heavily in the area, and from driving through the electorate it appears there are more candidate signs out here than in Tamworth or even Armidale. "It's hard to get in contact with any parliamentary people," Sophie says. "Unless they really focus on you, then it's hard to get a proper answer or concern out of them for the area. "We can't drop everything and go and move somewhere else. This is where our home is. And this is where we want to stay. They don't understand that we have a strong connection to this place, and we just can't move somewhere else and keep going.